A computer aided system has been developed for the support of orthopedic surgery. The system provides a wide range of facilities for the design, control and navigation of clinical interventions, primarily aimed at knee surgery. For the purposes of pre-operative planning and the control during the operation, the system builds 3D models of the anatomical structures based on individual image sequences of the patient. The flexible structure enables the system to be configured to different orthopedic operations. The first application is prepared for knee ligament surgery (anterior cruciate ligament reconstruction). The work has been accomplished by a team composed of the R/D staff of SZTAKI and the Orthopedic Department of the Semmelweis University, Budapest. 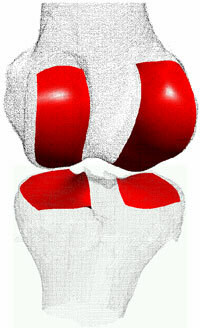 The knee joint is one of the most important components of the human motion system. Knowledge of the geometrical properties of the internal surfaces (condyles) and their functionality is crucial in understanding the complex behaviour of the knee. The discovery of these internal features is imperative for successful medical intervention in pathological cases of the knee. Traditional medical examinations can only provide limited information about the complex and hidden structures of the knee. Modern medical imaging technologies (CT, magnetic resonance imaging etc) provide advanced tools with which to investigate the morphological properties. This is extremely important for acquiring in vivo information during different motion phases of the knee. However, the raw data directly provided by these imaging techniques represent only two-dimensional (2D) pictures of the anatomical objects. Conversion of the 2D image sequences into precise 3D representations suitable for detailed motion analysis is a challenging job. This can only be achieved with the help of computer-based methods of image analysis, geometrical modelling and reconstruction. Figure 1: Active surfaces of the femur and tibia. In addition to a scientific exploration of the geometry of the knee, the main purposes of this study were to support the development of knee prostheses with a new geometry, and to create various tools for computer assisted knee surgery. In the following some details of the surgical system are described. Such systems provide the means to assist the pre-operative design to allow minimal invasion and continuous control with the required precision during surgery. We are firmly convinced that a proper solution must largely rely on the permanent availability of realistic images and computer generated 3D models of the anatomical elements. The surgical system is implemented as a framework that integrates the most important design and navigation functions and enables fast adaptation to different kinds of clinical tasks. The flexible architecture of the system is a key feature that will allow it to be modified for other application areas (eg dental and cranial surgery). 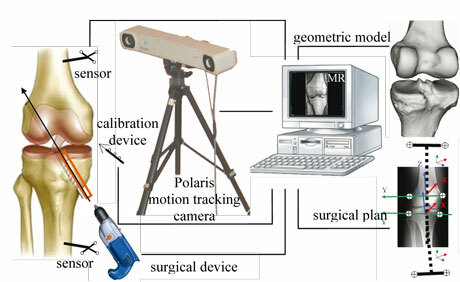 The system architecture facilitates the definition, creation and manipulation of clinical tools used during computer assisted surgery (eg surgical devices, drills, hooks, active and passive sensors, motion tracking cameras, calibration and navigation devices) together with the previously gained MR images and 3D geometric models. These tools can be placed into any arbitrary position and jointly moved after a series of well-defined registration steps. Figure 2: Typical system set-up. The system components used during navigation are arranged in a common hierarchical topology that is represented by a flexible tree structure. The root of the tree is the global space and the objects with their own coordinate system represent the nodes. The structure of the tree expresses the relationship between the embedded coordinate systems assigned to the objects. Some elements can be fixed to the global space, and by adding, deleting or reconfiguring elements, the whole tree structure can be modified. The associated local/global position and orientation values are recalculated runtime, according to the hierarchical topology. The local 3D spaces are mapped to arbitrary other spaces within the hierarchical topology through a series of 3D transformations. A wide range of visualization features is available to the surgeon through the graphical user interface, allowing the actual state of the system components to be monitored. Figure 2 shows the components of a typical system. Figure 3: Optimization of the ligament position. The first experimental application of our surgical navigation system was configured to meet the requirements of anterior cruciate ligament (ACL) reconstruction operations. ACL reconstruction is a frequent surgical intervention to replace the ligament torn because of excessive load during sport or an accident. The use of the computer-assisted navigation system offers significant advantages compared to traditional surgery. For instance, minimal surgical invasion is required, the ideal location of the replacement ligament can be well defined during the pre-operative design phase, and the position and orientation of the surgical devices can constantly be monitored and controlled during operation. 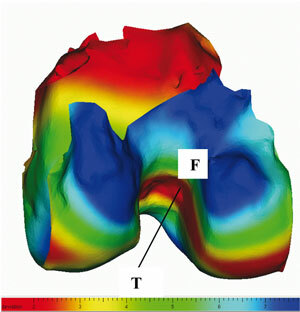 This technique assumes the availability of a precise 3D model of the knee based on the MR data of the patient, and appropriate procedures for performing the necessary geometrical calculations. One of the key problems is to define the fixing points of the ligament to the tibia and femur with the condition that the length of the ligament is constant during the normal flexion of the knee. Proper placement of the cruciate ligament is very important to prevent both over- and undertension of the replacement tendon. Programs have been developed to support pre-operative calculation and analysis of the variation in ligament length during motion, and to provide tools for graphical representation. Figure 3 shows nearly optimal positioning of the fixing points on the tibia (T) and on the reconstructed surface of the femur (F). The femur surface is colour-coded according to the relative change of the distance between the fixed tibia point and the varying femur points during flexion. In addition to the above geometrical calculations, the clinical system incorporates tools for setting up, registering, configuring and controlling the navigation facilities, the operating environment etc, as defined in appropriate medical protocols. Due to its flexible architecture, the system can easily be reconfigured to other kinds of orthopedic interventions.